The floods that ravaged India’s northernmost state and enveloped the nation’s consciousness just weeks ago seem to have fallen out of favour with popular opinion as other border events grab headlines. Yet the people of Kashmir are far from normalcy as disease, overcrowding, and a lack of food and water continue to aggrieve. As a newly initiated study aims to uncover the causes of the catastrophe, experts are beginning to reassess the real impact of climate change on the region. Meanwhile critics are questioning the governments’ awareness of this impact, and asking the all important, “Could it have been prevented?” For this was neither a sudden cyclone nor an unforeseeable earthquake. It was just heavy rain. The sudden floods have been attributed to an anomalous interaction between the Western disturbances and the monsoon cloud system. Both these are annual weather phenomena in North India: causing rain in different parts at different times in the year. However, this is the fourth major flood since 2005 that has been blamed by government officials on abnormal interaction between the monsoons and the western disturbances, including last year’s deadly Uttarakhand floods. Chandra Bhushan, deputy director of the Centre for Science and Environment, an independent research organization, is not so sure. This is not “a good enough answer”, he argues, pointing out that the Ministry of Earth Sciences refuses to “ever mention the term climate change” when talking about these tragedies. Certainly the frequency of these “extreme” weather events leaves questions to be answered. The global panel on climate change (IPCC), has already pointed out in its most recent report that intensity of rainfall in India is going to increase even as the number of rain days decreases. The reasons cited include continued greenhouse gas emissions, deforestation, and uncontrolled urbanisation. CSE, and an article in The Third Pole, have drawn comparisons: citing the massive tree cutting and encroachments on river land (around Jhelum river) in the state over the last two decades, caused by rising populations on both the Indian side and the Pakistani side. Choking of the riverbeds, and the growth of emission creating industry have also been raised as causes. To irritation of some, however, the Indian government refuses to raise the “inconvenient” possibility of such an anthropogenic (man-made) cause. The climatic causes will continue to be the subject of much debate; so too will the response and prevention, or lack thereof. The India Metrological Department had issued a heavy rainfall warning; and many have criticized the government for not taking preventive action. The issue has descended into a blame game between India’s Central govt. 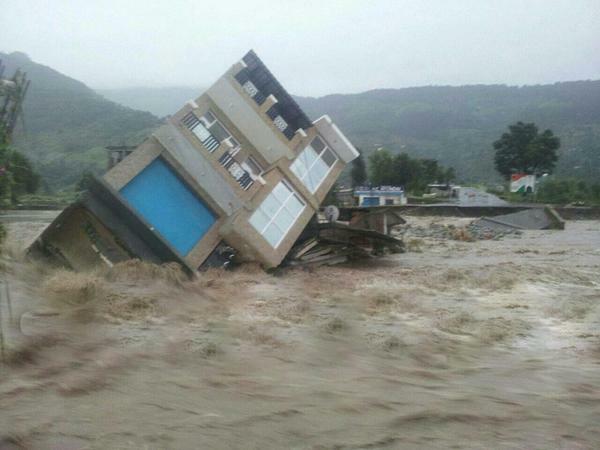 and the state government of Jammu and Kashmir. Even study mentioned earlier, to be conducted by CWC, is not devoid of politics: it was commissioned by the center on the Chief Minister’s angry request. The main point of conflict however, is the response to the disaster. The Indian army played a major role in rescuing trapped civilians, and after allotting a Rs. 1000 crore to relief, the Central govt. considered its duties fulfilled. However, the state authorities, accused of providing inadequate relief and rehabilitation for those rescued in army efforts, claim the Prime Minister could have done more. As the allegations were abound on either side, the net result was that refugees and rescued citizens were left by the army in relief camps managed primarily by non-governmental actors. Other than the army, local groups and NGOs have been credited greatly for rescuing many of those in need. The situation in the state, however, especially the susceptible valley of Kashmir, remains dire. Tens of thousands of residents have lost their houses, their belongings…everything. They are surviving in relief camps across the state, which are being run on donated materials and philanthropic funds. Clean water is a scarcity, and the resulting risk of fatal disease is growing everyday. As the harsh winter begins to set in, clothes and blankets being sent from all over the world, and collected by gregarious networks of volunteers, will hopefully help those affected. There was a success: in the rescue efforts, both by the army and the volunteers; in the solidarity and empathy shown: as people in India, Pakistan and the world rushed to do what they could to help; and most importantly in the fight of the Kashmiris and the people of Jammu, as tremendous visuals show us how they fought nature to survive and thrive. There were failures of course: the government response garnered such anger from locals as they pelted state officials with stones and made clear their disatisfaction; and again India and Pakistan failed to work together – an initiative that would definitely have helped both affected countries. However, the establishment of the climatic cause of this tragedy, and the prevention of another remain the most important priorities for now.